I will happily announce myself as one of those people who read Eat Pray Love and felt changed by it. Not monumentally, but it's one of those books I can add to my list of things that changed my perspective on living. I wrote a little bit about it back in September of last year. We won't talk about the film because that was dire. Since then I've been following what Elizabeth Gilbert has been up to, noting down any new releases or any projects she's announced. I never picked up the 'sequel' Committed as I felt the subject (marriage) didn't really have any sway on me at the time, and I still haven't picked up any of her fiction writing, despite The Signature of All Things being relatively close to the top of my TBR after hearing a segment from it read on The Dinner Party Download (I think). 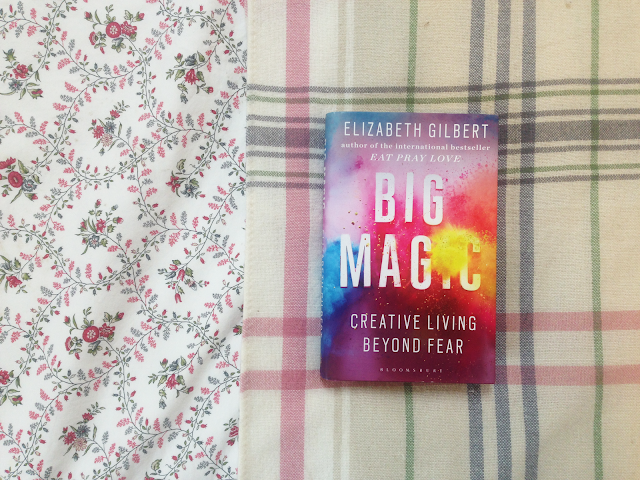 Big Magic takes us through Liz's beliefs about creativity and how she believes it to work. She talks about our fear of being creative as we worry everything we create will fail, and how we need to be able to create without this fear, as success should not be our only desire. She openly discusses her feelings of having a handful of only moderately successful books after the enormous popularity of Eat Pray Love and how that no longer affects her as she creates what she wants and needs to create, despite how well other people will receive it. Creating is a personal endeavor. One of my favourite sections from the book surrounded the idea that ideas themselves only hang around for a certain amount of time before finding someone else to turn them into something tangible. Liz talks about this idea for a novel she had and planned for a long period of time, before getting distracted by other things, and by the time she went back to it, the idea had disappeared. Years later after first meeting author Ann Patchett only a few times, a conversation led to the revelation that Ann herself had this idea for the novel too, but Ann stuck with it and eventually published. It's very bizarre how almost identical their stories were, down to very specific details, despite never speaking to one another about it previously. Big. Magic. After Big Magic had been announced, I discovered via someone's blog that Elizabeth had started releasing podcast episodes as a companion to the release of the book. In each episode she would interview someone who had been in contact with her about losing their bond with their creativity, either after the death of a loved one, being stuck in 'the most boring job in the world', or just not having time for themselves after having children. Gilbert would apply some of the ideas from her book to their situations in order to create an action plan and a new way of thinking about creativity in order for them to create what they were wanting to create. In alternate episodes to the interviews, she would interview a famous creator and introduce them to the issue the person was having in order to gain a different perspective. Gilbert and the creator would share their ideas on creativity, and give them more advice on how to move forward. The two final episodes of the podcast were were it really shone, the penultimate going back and interviewing the women from earlier podcasts and seeing where they were creatively in the present. It was fascinating to see how far they'd come and what plans they had for the future. In the final episode, Elizabeth chatted with her friend Brené Brown (who I also LOVE) about creativity, their friendship, and life. It was rather inspiring. Back to the book: I adored Big Magic. It was completely different to Eat Pray Love, but just as inspiring and refreshing. The small sections of the book made it easy to consume and immediately reflect back on, with Liz's thoughts integrated with personal anecdotes as well as the stories of other creatives. Despite not being myself what I'd call a 'creative' (i.e. not working in a creative field), I found this book very helpful in adjusting my way of thinking about why I do things. Throughout my life I've had creative ideas, but given up on them after one page, branding myself as not creative enough. Now I'm starting to think otherwise.